Sister to the more famous Pat Lewis, Detroit singer Diane joined her in the Adorables girl group who recorded tracks for Ed Wingate's Golden World label. These weren't issued in the US at the time but "Ooh Boy" and "School's All Over" became Northern soul favourites when released in the UK in the 70s. Diane herself only had a couple of releases under her own name but the tracks did include one stone gem. 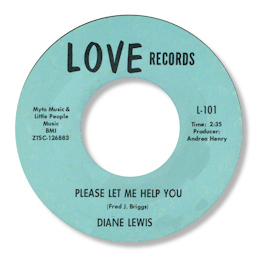 Please Let Me Help You is a really fine piece of songwriting from Fred Briggs to start with. And when it is put in the framework of a very sympathetic rhythm section and a big horn section well up in the mix you get the perfect backdrop for Diane to create a deep soul masterpiece. The first issue on Love (owned by Ed Wingate) specifies MGM recording artist Andrea Henry as the producer, but when it came out on Wand vocalist Herman Griffin’s name was added. And the track was about 30 seconds longer too – so that is the version you can listen to at this website. Pat’s second Wand 45 has a big Northern item on it but the midpaced “Giving Up Your Love” is rather better to my ears. But not quite as good as the version cut by the Players or Twentie Grans, both on Columbia. Throughout the late 60s and early 70s Diane and her sister sang background vocals on a large number of Detroit recordings, and they also appeared on Isaac Haye's seminal "Hot Buttered Soul" LP. The group took their name from the album and as Hot Buttered Soul they opened for Hayes at almost all his gigs until the early 80s. The sisters also took part in some of the Motown revival shows and recordings in the 80s and following decades.